on a street somewhat like yours. Please don’t think I’m exaggerating when I say that Local News from Someplace Else by Marjorie Maddox is one of the best and most nourishing poetry collections I’ve read in quite some time. Cancer, murder, poverty, 9/11, Hurricanes Sandy and Katrina, mine cave-ins, lighting strikes and railway disasters, even the specter of Death himself, dressed up as children–or is it children dressed up as death?–all of these play more than mere cameo roles in her new collection of poems Local News from Someplace Else. I’ve been featuring some highlights from her new book leading up to this review and last time I featured my reading of her poem “Meteorology.” You can read a discussion with the poet about that piece on TweetSpeak . And to know a bit of her story in her own words, you can delve into Marjorie’s own “Journey Into Poetry” on TweetSpeak as they featured previews of the book this summer. Just before Halloween, I read “Treat,” also from the Local News collection. I’ve devoured the entire book at least three times since it came out early this fall, so it’s high time I got around to telling you about it in-depth. soon when we fly that way . . .
One the quandaries contemporary poets have involves hashing through all the discussions about what poetry is and what it should do, from the tirades about form, rhyme, meter, and free-verse to the debates over accessibility versus complexity, the tensions between substance and form, relatability and ambiguity, to wading through all of the various opinions and judgments about what has become a somewhat obscure art (currently in the midst of a cultural comeback, one could argue), or in putting all of that hubbub aside and simply doing it, producing poems that have both soul and artistry that hit us in the gut or tingle our nerves, taking themselves seriously without becoming maudlin. This is especially true of poems about tragedy, whether it be personal, national or global. How does one write about suffering and pain without the pain and suffering muddling up the works? It’s difficult to find words when we are hurting, when we cannot think clearly how to communicate our experience in a way that is productive, not to mention delightful or surprising? Handling these challenges is what Maddox does with great skill. I remember being a child and wrecking my bike. I was bleeding and in pain, balled-up on the sidewalk yelling at my brother to keep away. How could I explain that his touching my leg, asking if it hurt, his constant urging of me to answer–how could I relay to him that it was just making the situation worse and that I needed a moment for the pain to die down before I could think or react rationally? Fortunately, my sister understood and waited quietly for my crying to diminish before she approached and gently offered aid in practical and noninvasive ways. This is what Wordsworth was getting at when he said that poetry “takes its origin from emotion recollected in tranquility.” Much of what people write and call poetry either revels too much in blood and guts, or tries to stand at too far an intellectual distance from it. It’s not that Whitman’s “barbaric yawp,”or Ginsberg’s generational “Howl” don’t need to be voiced, it’s just that the quality of their work argues that both poets actually put a great deal of time and thought into those guttural noises before they were completely crafted on the page. And while you might argue that each went a bit over the top at times, it’s still obvious that their work is remembered not just for its noise but for its artistry, and for the poets’ skill. Marjorie’s poems are neither preachy nor pedagogical, and she never comes off as a life-coach. Yet I found this collection profoundly helpful during what was a difficult season for my family and close circle of friends, comforting in the way that good poems can comfort, reminding you that you are not alone, and helping you to see the familiar in the unexpected, enriching not only in the soul of their content but in the beauty of their form. From the shaped poems “Sixteen-Inch Black-and-White” and “March 16,” to the music of slant rhymes and alliteration in poems like “First Snow” and “After,” Maddox has a deft hand for form, rhythm, and sound play. Good free verse isn’t so free and easy, but she makes it seem like it is. “She comes from a good family. Amidst the common and not-so-common personal injuries and illnesses, including multiple trips to the Emergency Room, our household and friendship circle had been shaken by several tragedies since this summer, a diagnosis of cancer, and several deaths, including a close friend’s suicide. These tragedies leave us worn, tired and wounded. Some of them we conquer; some pass on their own, and some leave us forever changed, but generally, except for some aches and scar tissue, they do leave us. And Maddox reminds us of that too. Do yourself a kindness. Who says you cannot buy a present for yourself this year? 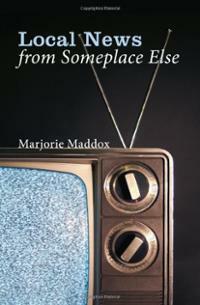 Get Local News from Someplace Else, by Marjorie Maddox. Your analogy about the difference between your brother’s and sister’s approach to your pain is a really good one! I also really enjoyed your analysis of Maddox and now will put her on my list of poets to enjoy. A bunch of good observations in this. Good to hear your readings again…enjoyed post. that anecdote of when you came off your bike is good…as much as it’s great to write in the heat of the moment,a bit of distance can distill some clarity into the words. Those heated moment writes are rarely ones that I can share, only sometimes after ditance, pause and careful polish. 🙂 Thank you!